February 14th is a time for romance. Head to the beach and find the mate of your dreams. Like this guy, stretched out on his back. Yes, he snores a little. But he is helping to bring his race back from the brink of extinction. 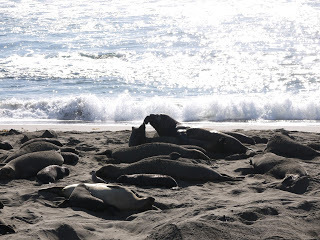 According to http://www.marinemammalcenter.org/education/marine-mammal-information/pinnipeds/northern-elephant-seal/ there were fewer than 100 northern elephant seals by 1910, down from around 15,000, due to overhunting for lamp oil. 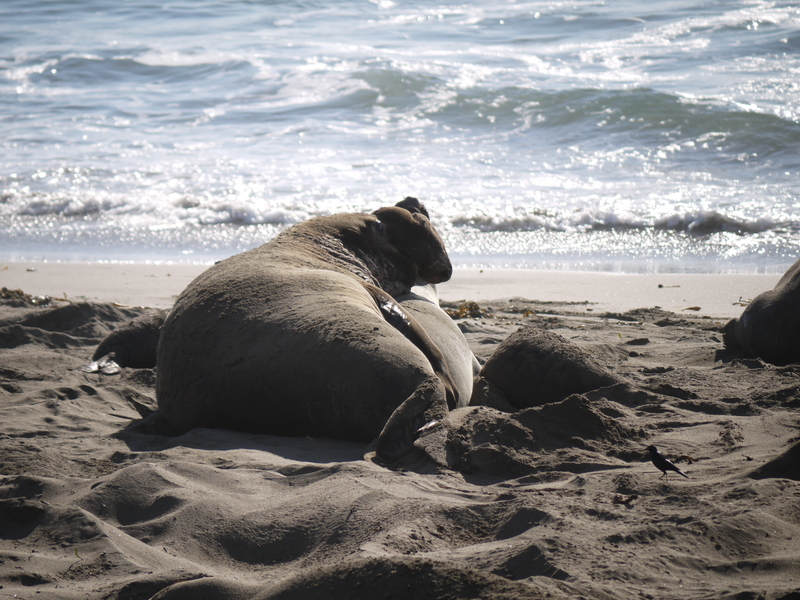 Valentine’s Day is the peak of mating season for the Northern Elephant Seal. 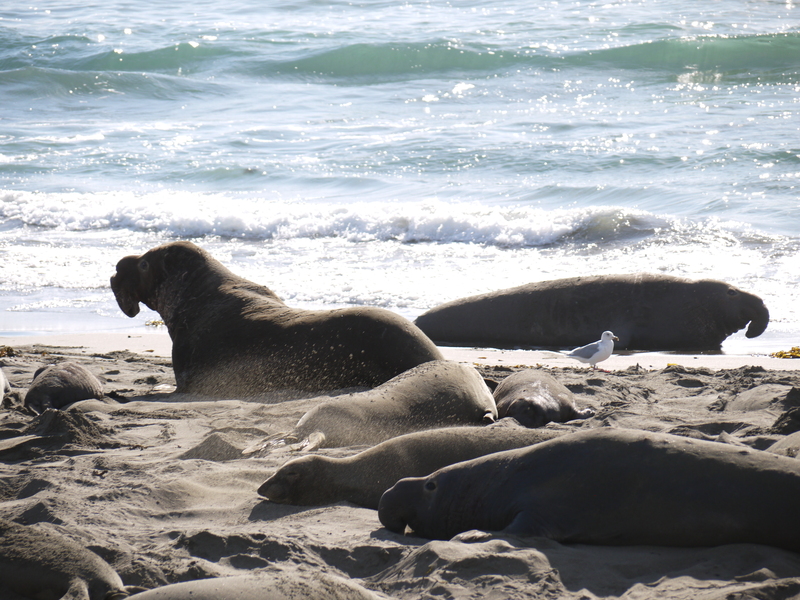 This beach is about seven miles north of San Simeon, near the Hearst Mansion. 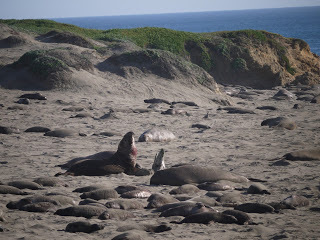 It’s called the Piedras Blancas rookery, because it is the site to which these elephant seals return twice a year to mate and bear their young. 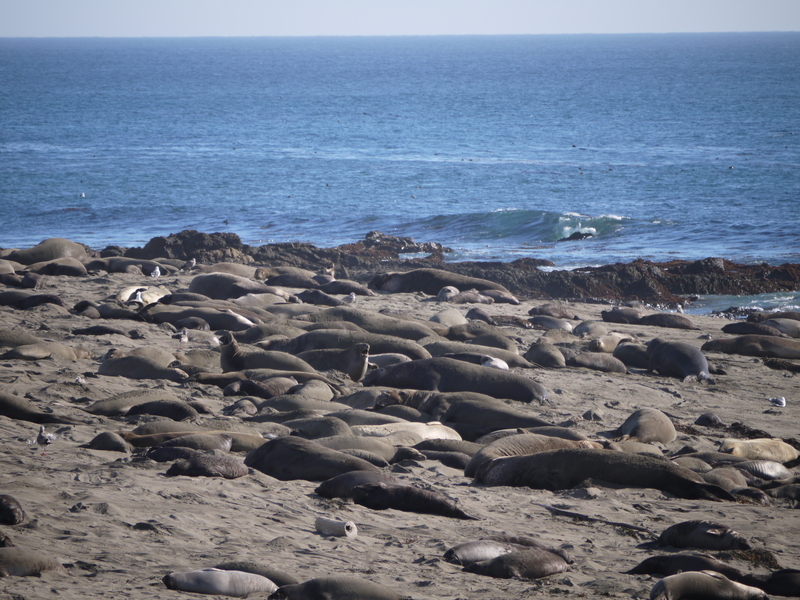 You can view the elephant seals from raised boardwalk viewing platforms on the bluffs. I was impressed. Every single visitor was quiet and respectful toward the seals, (and each other.) I was awed by experiencing the intimate lives of these enormous creatures in such close proximity. 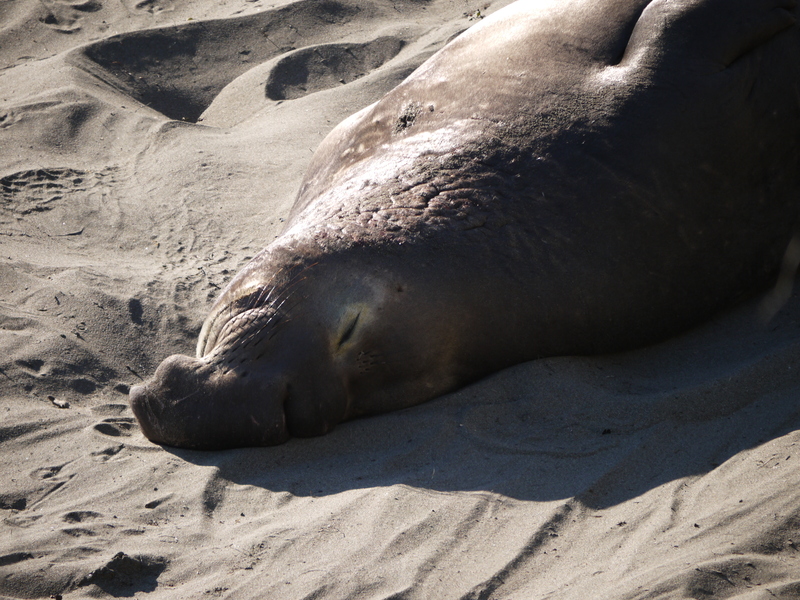 The largest male elephant seal I saw was, I’d guess, around fourteen feet, but they can grow up to sixteen feet long, and over five thousand pounds! The pictures can’t capture the scale, because volunteers ensure that no humans disturb the seals by going onto the beach. This is for the seals’ protection, but frankly, you wouldn’t stand a chance against one of the big guys. That large,snoring male was bigger than our SUV! The pups and females scurried out of their paths as powerful, blubbery males hulked across the sand, sometimes pursuing a female, and other times battling other males. The pups’ piercing cries for their mothers, and the bellowing call of the males, were cacophonous. 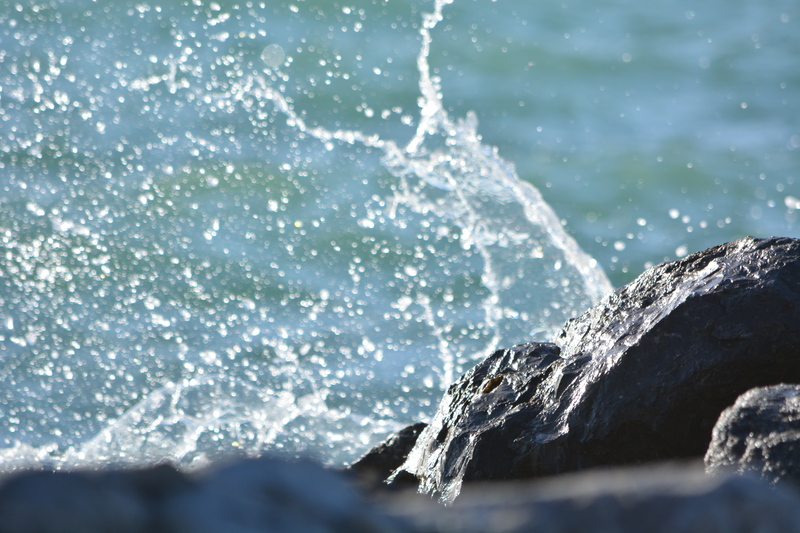 The sparkling sea added to nature’s noise. I could have stayed all day. As you’d expect, this isn’t a place to bring your dog. Mine was happy with the windows down in the parking lot, nose in the cool, fresh breeze. If you make the trip, you might want to bring a jacket, plus sunglasses and sunscreen if you go in the afternoon, as the beach faces west. And, of course, your camera! *No animals were disturbed in the making of this post. A zoom lens and great spot on the viewing platform are all you need.